New album, new label, new network...new look! Volcano: Good, Bad, or Ugly? How do you feel Volcano has handled Al's releases when compared to Scotti Bros.? As the end of the decade, century, and millennium approached (well, sort of), some people might have been wondering how pop culture was going to evolve. And of course fans were wondering if Weird Al would be able to lampoon it. After all, Al had already been around for twenty years. What else could he possible offer now that he hadn't before? The answer came with Al's tenth album in June 1999, the jovially titled Running With Scissors. It would actually be the first album since perhaps 1984's In 3-D whose title and cover gave no indication of what surprises were inside. And Al certainly had a number of surprises in store throughout the year. When looking at Running With Scissors, the first thing one might notice is Al sporting a brand new look on the cover. Gone were Al's trademark glasses and mustache (the former due to Al getting LASIK eye surgery to correct his vision), and his normally "puffier" hair had been combed down, parted in the middle. Although fans had seen Al's makeover off and on since early 1998, for many people this was their first look. Naturally, it would become a frequently asked question in interviews. Another change happened behind the scenes. In 1998 All-American Music, the company that owned Al's label Scotti Bros. since early 1996, was acquired by Volcano Entertainment. Volcano was just one of the record labels owned by the Zomba corporation, home to such a-list recording artists as the Backstreet Boys, Pink, *NSync, and the vapidly untalented Britney Spears. Zomba's desire to include Al alongside its biggest stars became apparent with the addition of Al tracks on special compilations produced for K-Mart and Target. A new record label meant there would be some changes for Al. Perhaps most significantly was the fact that Volcano does not issue retail singles in the United States. Although Al hadn't cracked the top twenty on Billboard's "Hot 100" chart since 1984, the singles did usually find a modest audience. Plus, since 1994 Al often snuck alternate mixes of songs onto his CD singles, so fans were understandably disappointed with this news. However, Volcano continued to send promo singles to radio stations and even created entire web sites to promote Al's newest music videos. Being part of the Zomba family also meant that Al would have significantly more exposure internationally than he had before. Sure enough, Australia got an exclusive single of "Pretty Fly For A Rabbi," while Japan saw a brand new compilation titled The Saga Begins. Al's worldwide success would only grow in the coming years. Volcano allowed Al to create his own imprint for his releases, perhaps as a way to acknowledge that Al was unlike any other artist under the Zomba umbrella. Named Way Moby, a reference to an episode of The Weird Al Show, the new logo has appeared on the packaging of every one of Al's Volcano releases, including the reissues of the pre-1999 albums. Although there may very well have been some kind of legal need for it, publicly the imprint seems to serve no other purpose than as a sort of "Weird Al seal of approval." The first single off Running With Scissors was "The Saga Begins," an ode to the biggest movie blockbuster of the summer, Star Wars Episode I: The Phantom Menace. Set to the tune of Don McLean's pop classic "American Pie," one small obstacle stood in Al's way while writing the parody...the movie wasn't released yet! Al had to piece together the plot by searching every Star Wars fan site on the Internet for spoilers large and small. In fact, after paying $500 to attend a special sneak preview for charity, Al only had to make one or two minor changes to his lyrics. When Al asked Lucasfilm for the okay to release the song, the response he got back was "You should have seen the smile on George's face." The anticipation for "The Saga Begins" was quite great. Volcano's official web site for the single promised to make the music video available for streaming, while the Radio Disney network was chosen to give the song its world premiere. Radio Disney would continue to support the song throughout the year, even though the network had a problem with the line about Anakin "hitting on the queen." Al returned the support by recording a special "clean" version of the line for the network. Since there was no music video for "American Pie" to model a parody after, Al came up with a "Star Wars Unplugged" concept for "The Saga Begins." Al fashioned the parody with an ambitious, high-concept video based on elements from the various Star Wars movies. Al took the place of Episode I's Obi-Wan Kenobi, Rubén was Emperor Palpatine from Return of the Jedi (or Darth Sidious from the prequels, depending how you look at it), and the settings were direct from A New Hope. 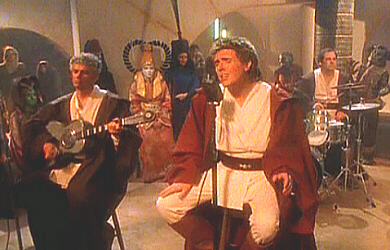 The centerpiece of the video was a performance at the Mos Eisley Cantina by "Obi-Wan Al," "Darth Rubén," and Jon, Jim, and Steve as a robed "Jedi band." The audience consisted of various aliens, mostly original characters created for the video, but such high-profile Star Wars characters as Queen Amidala, Mace Windu, and even Yoda were among the crowd. The performance was bookended by scenes of "Obi-Wan Al" wandering the deserts of Tatooine, capped with a shot of a clone army of Als singing the final chorus. Although Al admits that the costumes and effects ate into the production budget, thus preventing him from crafting a laugh-a-second video like he has in the past, "The Saga Begins" remains one of Al's most extraordinary directing projects. Despite the quality of both the parody and its video, "The Saga Begins" may have been a curious choice for a lead-off track off a Weird Al album, as it clocks in at over five minutes long and parodies what is essentially a rock "oldie." In fact, MTV, a longtime supporter of Al's videos, only aired the clip a few times (and often in a truncated form). That August the network would give better exposure to the album's shorter second single, "It's All About The Pentiums," and in December would air the traditional Al-TV special. MTV would continue to utilize the "Pentiums" video through May 2001 when it was included in the Funniest Videos of All Time special. Al would have better luck, meanwhile, on MTV's sister station, VH1. In addition to including both "Saga" and "Pentiums" in its normal video rotation, throughout the year 1999 VH1 devoted hours upon hours to Weird Al programming, giving Al regular television exposure unlike anything he's ever seen before (perhaps with the debatable exception of The Weird Al Show). The most notable program the network produced was an episode of its popular Behind the Music series, tracing Al's life and career from his birth to the release of Running With Scissors. It was the first serious biography ever done on Al and perhaps the first serious appraisal of his place in popular music. Al's episode of Behind the Music would go on to become one of the most popular in the series, and a VH1 online poll even showed that it was the most popular among episodes focusing on 1980s artists. During the year, VH1 would also ask Al to host both the annual Fairway to Heaven golf event and a whole day of Al-related programming from the safety of an underground bunker, ready for the rumored destruction of the world due to the Y2K bug. To this day, Al continues to be a regular fixture on the network. No doubt due in part to Al's almost-constant exposure on VH1, that year's Touring With Scissors became the most successful of Al's career. Spanning over the course of seventeen months, the tour took Al and the band all over North America, including a number of states they have never ventured into before (Hawaii remains the only state Al has not performed in). For the tour Al concentrated heavily on material from the new album, but he also brought back "Dare To Be Stupid," premiered "The Night Santa Went Crazy," and added two new concert-only parodies, including the well-received pizza-themed "My Heart Will Go On" parody "Free Delivery." The tour also featured the fond farewells of two concert staples, "Bedrock Anthem" and the "Truth or Dare version" of "Like A Surgeon." Rubén was finally able to retire the cone bra. Maybe because he knew that the tour setlist would need to have some major shake-ups next time to accommodate future new songs, Al finally listened to the pleas of many fans who had wanted a live album. He did one better, though, by producing a live video! Released that November, "Weird Al" Yankovic Live! contained essentially an entire Weird Al concert (minus a couple of minor aspects due to legal issues, such as the concert-only parodies). For anyone who had never seen Al live before, it was perhaps the closest they would get. The video was followed by a souped-up DVD release in early 2000, which also contained clips from the recent Al-TV special, among other extras, and was perhaps an indication to what Al was capable of for another much-requested DVD release, UHF. VH1 would help promote the release of the video by airing a special one-hour version of Live! This would be the second Weird Al concert program in just three years following the Disney Channel's There's No Going Home. Since Al made a lot of changes in those three years, the differences between the two specials were like night and day. As everyone looked to the future and the new millennium, one thing was clear: Weird Al would always be around, and he would always be striving to fine-tune his craft.